Marco Ajello, an astrophysicist who has spent much of his career studying the evolution of distant galaxies made a new research on black holes and discovered some new ones. The discovery of these supermassive black holes, which launch jets that emit more energy in one second than our sun will produce in its entire lifetime, was the conclusion of a yearlong research project. Ajello said: "Our next step is to increase our understanding of the mechanisms involved in the formation, development and activities of these amazing objects, which are the most powerful accelerators in the universe. We can't even come close to replicating such massive outputs of energy in our laboratories. The complexities we're attempting to unravel seem almost as mysterious as the black holes themselves." A team led by Ajello with Clemson post-doc Vaidehi Paliya and Ph.D candidate Lea Marcotulli made the discovery. The trio worked closely with the Fermi-Large Area Telescope collaboration, which is an international team of scientists that includes Roopesh Ojha, an astronomer at NASA's Goddard Space Flight Center in Greenbelt, Maryland; and Dario Gasparrini of the Italian Space Agency. Their scientific paper titled "Gamma-Ray Blazars Within the First 2 Billion Years" was published on Monday in a journal Astrophysical Journal Letters. The Clemson team's discoveries were made possible by recently introduced software on NASA's Fermi Gamma-ray Telescope. Ajello said: "People are calling it the cheapest refurbishment in history. Normally, for the Hubble Space Telescope, NASA had to send someone up to space to physically make these kinds of improvements. But in this case, they were able to do it remotely from an Earth-bound location. And of equal importance, the improvements were retroactive, which meant that the previous six years of data were also entirely reprocessed. This helped provide us with the information we needed to complete the first step of our research and also to strive onward in the learning process." 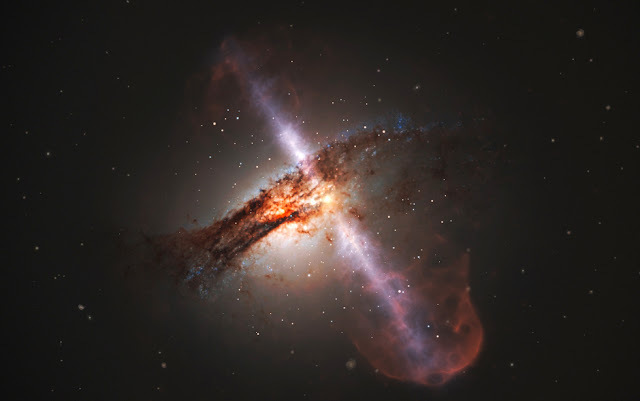 Using Fermi data, Ajello and Paliya began studying it for over the course of a year, they narrowed their search to 1,100 objects with a catalog of 1.4 million quasars, which are galaxies that harbor at their centers active supermassive black holes. Paliya said: “After using our filters and other devices, we were left with about 1,100 sources. And then we did the diagnostics for all of these and were able to narrow them down to 25 to 30 sources, but we still had to confirm that what we had detected was scientifically authentic. So we performed a number of other simulations and were able to derive properties such as black hole mass and jet power. Ultimately, we confirmed that these five sources were guaranteed to be gamma-ray blazars, with the farthest one being about 1.4 billion years old from the beginning of time." Marcotulli, who joined Ajello's group as a Ph.D student in 2016 said: “We're trying to understand the full spectrum of the energy distribution of these objects by using physical models, We are currently able to model what's happening far more accurately than previously devised, and eventually we'll be able to better understand what processes are occurring in the jets and which particles are radiating all the energy that we see. Are they electrons? Or protons? How are they interacting with surrounding photons? All these parameters are not fully understood right now. But every day we are deepening our understanding." Ajello said that only one of every 10 black holes in today's universe are active, but in earlier times the ratio was 50-50. All galaxies have black holes at their centers - some of them are active, others are not. Our own galaxy has a black hole at its center that is currently inactive. The five newly discovered black holes are the largest from all the black holes, those have been observed earlier. One of the most surprising elements of Ajello's research is how quickly - by cosmic measures - these supersized black holes have grown in only 1.4 billion years. In terms of our current knowledge of how black holes grow, 1.4 billion years is barely enough time for a black hole to reach the mass of the ones discovered by Ajello's team. Ajello said: "How did these incomprehensibly enormous and energy-laden black holes form so quickly? Is it because one black hole ate a lot all the time for a very long time? Or maybe because it bumped into other black holes and merged into one? To be honest, we have no observations supporting either argument. There are mechanisms at work that we have yet to unravel. Puzzles that we have yet to solve. When we do eventually solve them, we will learn amazing things about how the universe was born, how it grew into what it has become, and what the distant future might hold as the universe continues to progress toward old age."